convenient form of portable fuel supply. 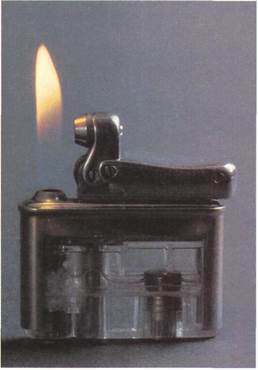 Butane, for ex­ample, is used in cigarette lighters. Camping stoves and lamps, and even auto­mobiles and trucks can also be fueled by liquid alkanes. Such alkanes are called liq­uid petroleum gas (LPC) in automotive applications. The first four alicyclic hy­drocarbonsare illustrated in the diagram (top right!. They resemble both straight- and branched-chain alkanes in consisting of only carbon and hydro­gen atoms. But their car­bons are linked in a ring structure. This means that alicyclic hydrocarbons have a different general formula from that of their chain-structure analogues: C„H2„ (where n is the number of carbon atoms). The three-di­mensional shapes of alicy­clic hydrocarbons are often depicted as flat rings. In fact, the rings are puckered in all except cyclopropane. This puckering is exempli­fied well by cyclohexane. It can exist in several puck­ered conformations, two of which are illustrated (lower right). Any one cyclohexane molecule can be flexed into different conformations. These vary from the "chair" form through various inter­mediates to the "boat" form, and back again. But not all of these forms are equally stable. The chair form is the stablest. At any given mo­ment about 99.9 per cent of cyclohexane molecules are in this form. finis. This means little affinity, or little attrac­tion, to other substances. In chemical terms, the hydrocarbons are relatively unreactive. All, however, undergo oxidation. They combine easily with oxygen. If they did not, they would not have become important in applications that depend on their combustion (ability to burn). They also undergo other types of reactions. These include halogenation (combining with one of the halogen elements: fluorine, chlo­rine, bromine, or iodine) and nitration (in which a nitrogen-oxygen group replaces a hy­drogen atom). The conditions required to sus­tain these reactions are often severe. Under extreme conditions, hydrocarbons will isomerize. This means that they break down partially and then recombine into differ­ent hydrocarbon isomers. Such isomerization is at the basis of the process used to increase the octane count of gasoline. The octane num­ber is based on the combustion (burning) properties of normal octane, which is as­signed a value of 100. Most gasoline used today has an octane number between 91 and 93.
temperature. Petroleum jelly is a soft, solid hy­drocarbon mixture obtained from crude oil. It is used as a barrier ointment to protect wounds and sores. Higher molecular weight hydrocarbons form hard waxes. These can be used as protective coatings for floors and fur­niture or as slow-burning materials—in can­dles, for example.